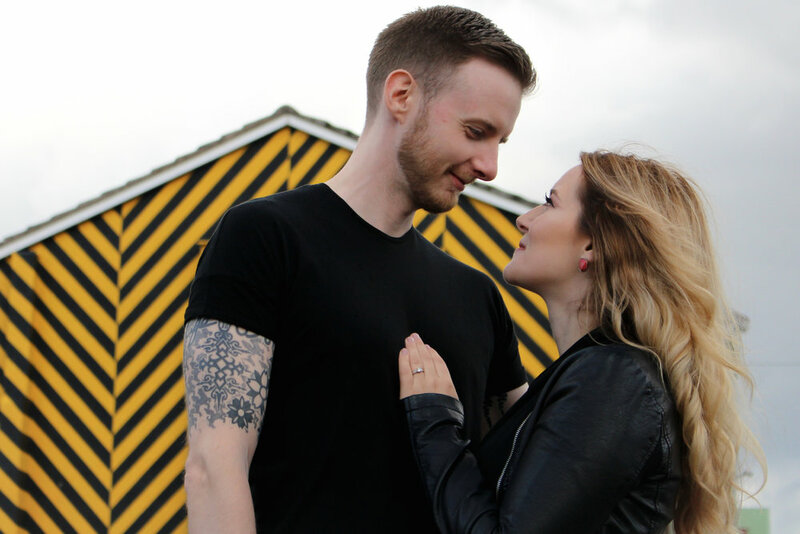 I first met Claire & Mathew at the beginning of this year to talk about their 2017 wedding. They were planning to get married on Claire’s 30th birthday and were going to celebrate the occasion in style at Worsley Court House, a fabulous Tudor-style venue. 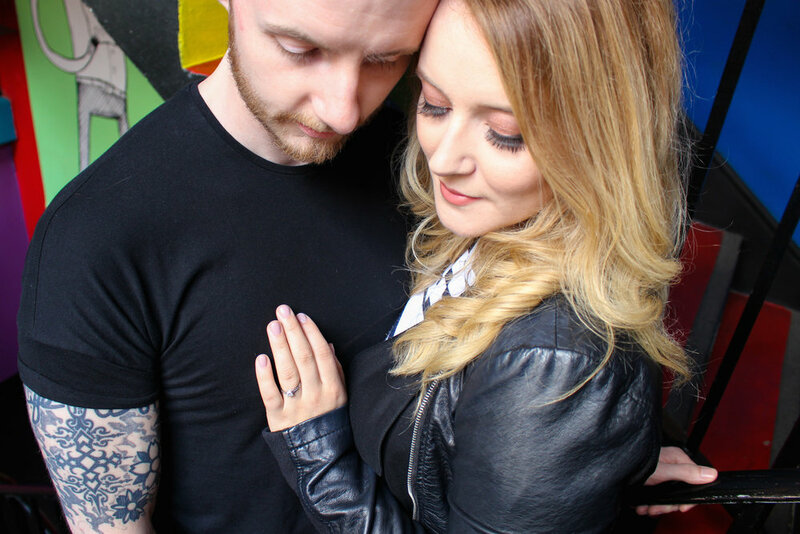 We chatted over a brew and I quickly realised that they were a creative couple who love popular culture and contemporary art, so when I discovered they admired Manchester’s graffiti as much as I did, we couldn’t resist hitting the streets for their alternative, urban Manchester engagement shoot. Anyone who knows me knows that I spend most of my time wandering, exploring and generally being curious. I try to look at familiar scenes from a different perspective and take time to notice the unnoticed. Even after 7 years of living in central Manchester, I never tire of discovering new things and factoring these things into my photography. 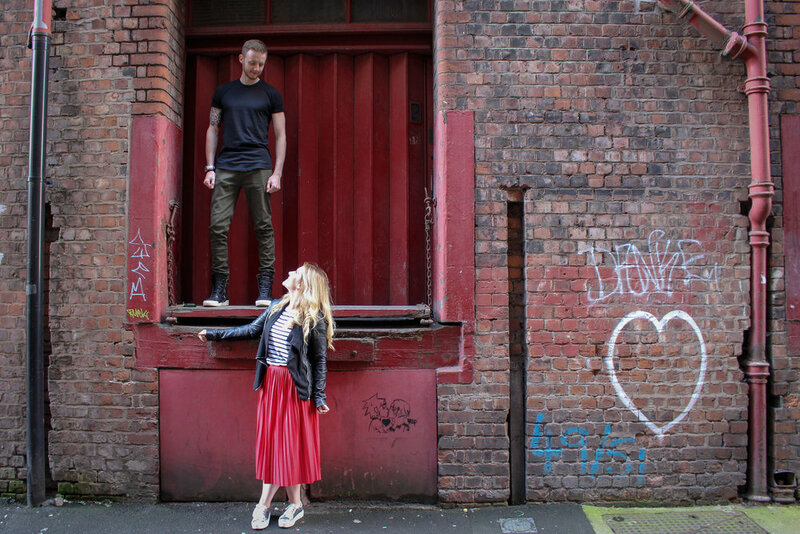 Our tour took us to the top of multi storey car parks, backstreets that looked like New York film sets and we experienced the eerie calmness of out-of-hours Afflecks – an alternative indoor market and iconic member of Manchester’s Northern Quarter. I moved bin bags, we braved the elements and Claire & Mathew brought the glamour throughout. Claire & Mathew are absolutely wonderful. It was great to spend this time with them to get to know them and try out some ideas in the run up to their big day. They are so well suited and completely adore each other - I cannot wait to photograph their big day next year!